Quote from concerned Siskiyou county Native and educator, "What bothers me is that the environmental community is using the native Americans to foster their own agenda, exploiting them more than what happened in the 1900's." KBC will momentarily remain silent while you read for yourself what is happening here. For a little background, geothermal wells have been and are being drilled for clean power in the Medicine Lake area...NOT by the lake. Environmental groups are using the tribes to establish some sort of 'traditional cultural district' to help shut down this power source. Last year a gathering was used by the environmentalists to make videos for the political agenda, and this weekend they have met in an entire campground. Most of the tribal people attending are looking for their stories and their roots, and fellowship. FLYER July 25, 2003. 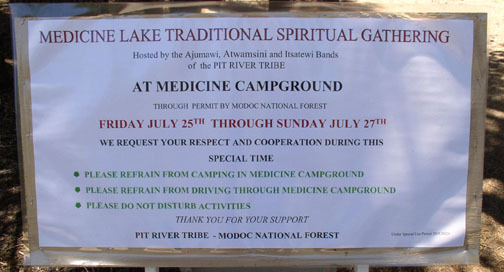 In the past, small groups of tribal members as well as local church groups and other spiritual groups, have meet at Medicine Lake. Last year an effort was made to have a larger organized meeting, and this year was the first of its size. MORE INFORMATION will be coming about this geothermal project. It is clean energy, NO seepage will be possible, no noise, no lake impacts. Environmentalist-agenda film using the tribes--CLICK HERE According to the power company, these claims are outright lies. That is why all of their permits have been approved, but now they are awaiting a lawsuit...the enemy's weapon so effectively used to unravel our society. Wilderness area wish list----Medicine Lake highlands and Captain Jack. See the maps---http://www.calwild.org/places/neca/map.html. Read the articles.